I use my microwave oven for two things, as a back-up timer and to disinfect my sponges. Killing anything alive is what a microwave does best, no? When people find out I don't put food in the microwave, they always ask, "how do you reheat leftovers and how in the world do you make popcorn?" I have to laugh because I know that anyone who is my age grew up without this appliance and surely remembers a time when our parents perhaps reheated last night's stew in a pot??? Yes, of course, it takes 5 minutes longer and then you actually have to wash the pot, but I am really not a fan of the microwave. Even though I can find studies making a case against the microwave, I can also find literature which outlines that microwaves are not bad for you. Welcome to the world of nutrition -- where you can always find someone who will tell you what you want to hear! So be it, but I still don't trust them and I think it changes the texture of many different foods and not for the better. And if memory serves me, I think it makes the food you are cooking less tasty. That's reason enough for me to not use one. What I can argue with conviction is that most microwave popcorns aren't worth feeding to a starving animal, let alone my kids. 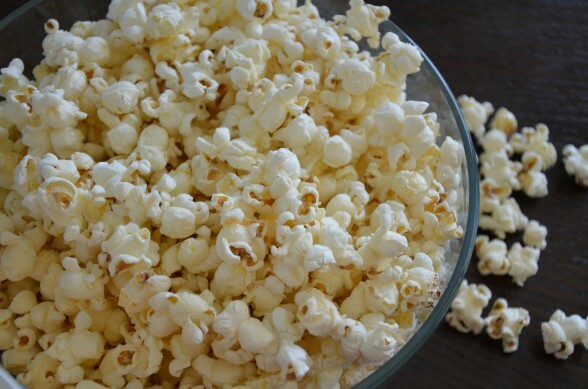 Have you read the ingredient list of many of the microwave popcorns in your supermarket? Here are just two examples: Pop Corn, Partially Hydrogenated Soybean Oil (Adds A Dietary Insignificant Amount of Trans Fat Per Serving), Salt, Natural Flavors, Annatto For Coloring, Soy Lecithin Popcorn, Partially Hydrogenated Soybean Oil and Cottonseed Oil, Salt, Modified Cornstarch, Maltodextrin, Monosodium Glutamate, Natural Flavor & Artificial Flavor, Color (Yellow 5 Lake & Yellow 6 Lake), Nonfat Milk, Freshness Preserved by Propyl Gallate. Nice. And that's just the ingredients inside the package. We're not even discussing the chemicals lining the bag itself. The good news is that you can still make popcorn the old fashioned way, the way my mom taught me -- on the stove. And you know what? It's sooooo much better than the microwaved junk if you follow a few key tips. First, use good quality popcorn, preferably non-GMO, such as Eden Oragnic. Next, use coconut oil to pop the corn. It's a more stable oil to heat than vegetable oils and it makes the popcorn taste like the kind you get at the movie theater. Lastly, keep the lid on the pot open a half inch or so to let some of the steam escape so that your kernels stay nice and crisp. Perfect for an after-school snack, sleepover party, to eat while watching your child or grandchild's Little League game and of course, to sneak into your local movie theater. Shhhhhhh! 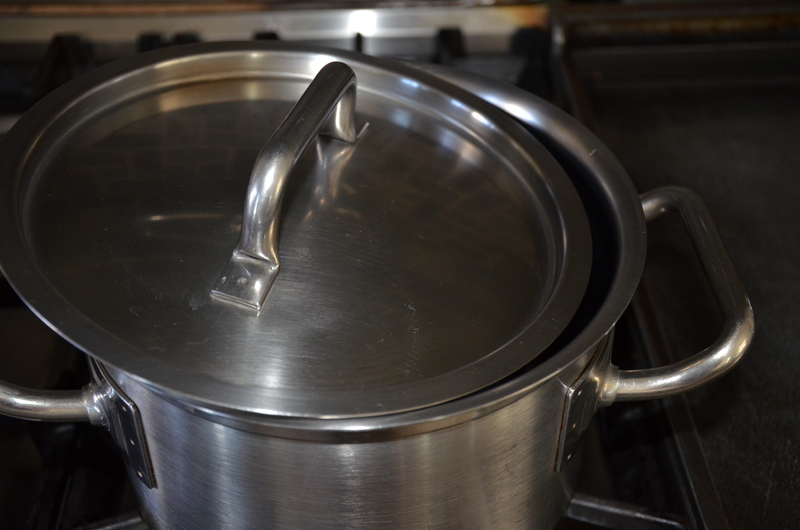 Heat the oil in a heavy bottomed 3-quart pot over medium heat. (I used one that was 8 inches in diameter and 5 inches deep.) Add 3 kernels of popcorn to the pot and cover with a lid. This is how my mom did it. Don't ask me why it was 3 kernels and not 2 or 4. 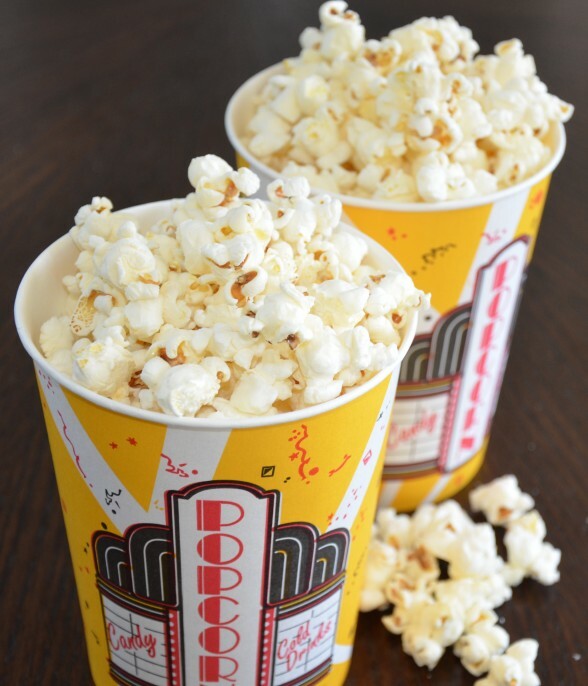 When the kernels pop (this usually takes about 2½ - 3 minutes), add the ½ cup of popcorn in an even layer and cover with the lid, but not all the way. 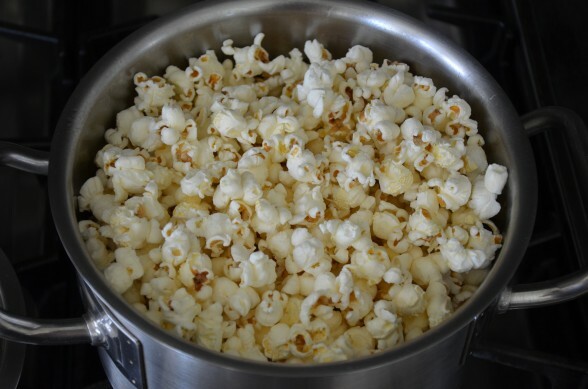 Leave it open about ½ inch to allow steam to escape but not wide enough to let the popcorn pop right out. Shake the pot every now and then. If you can't shake it with the lid ajar, cover the pot, shake and open the lid again when you return the pot to the heat. Once the popping reduces to several seconds in between each pop, take the pot off the heat and remove the lid. Sprinkle with sea salt and transfer to a serving bowl. Taste for salt and add another sprinkle if necessary. If you like melted butter on top, now's the time to drizzle it. I bought the paper popcorn containers at my local Smart & Final. Very fun for a party! If you don't have a lid for your pot, you can cover the pot with aluminum foil and poke a bunch of holes in it with a toothpick to allow the steam to escape. Do you think that ghee would be ok too instead of the coconut oil? My children don’t love the flavor of coconut oil but like ghee. Used cast iron oven 8.5 in W x 5 in H with measured 2 Tbsp unrefined coconut oil and a ½-cup of Bob’s Red Mill non-GMO popcorn. Heat source, 1800W Magneflux induction cook top, set to 450°. Heated up oil with 3 kernels, took 1 min 45 sec for all to pop. Added a ½-cup of kernels to oven; placed kitchen towel over open oven (catches steam) then put the lid on over the towel. Out of half a cup of kernels, only 2.5 oz actually popped (weighed un-popped kernels.) Ultimately, the temperature was right there, popping was occurring, still the end result lacked the luster of a full popping session. I dislike wasting foodstuffs. Same cast iron oven makes delicious roasts, chili and scores of desserts. Seems something relatively simple like popping corn should not be difficult to accomplish. Our daughter just got back from a 5day school backpacking trip. She said she wanted me to greet her at the bus with a healthy snack that would fill her up and this is what she chose. Huge improvement over the days of requesting donuts! Thanks for sharing your wisdom. Looks like you’re doing something right! love it! Microwave popcorn is really awful stuff. Truthfully, I think stovetop popcorn made with coconut oil is better than any other popcorn. As far as coconut oil goes, I use it to cook pancakes, French toast, roast vegetables (especially cauliflower and sweet potatoes), and more. Love the stuff! There are a few baked goods on my site that use coconut oil — check out the Oatmeal Chocolate Chip Cookies, Pumpkin Muffins and Zucchini Bread! love your website, just getting to learn about all you do from a couple friends. fabulous recipes! where, though did you get the cute popcorn tubs? would love to have some for my daughters pajama party!!! Thank you and welcome, Heidi! I bought the popcorn tubs at Smart & Final, but it was a few years ago so I don’t know if they still carry them. I’m sure you could call and find out. I did not know to leave the lid slightly off. Good tip. That’s probably why yours is crunchy and mine chewy! Who knew? Thanks, Pamela. I was tickled to see that you use coconut oil, as that has been my choice for popping corn also. I will certainly use the idea of leaving the lid part way open next time to allow crisping. I always look forward to your recipes and ideas. Check out Riehle’s Select for interesting types of “not microwave” popcorn – Shaman Blue, Organic Baby Yellow, Sunburst, etc. I got some as a gift years ago, and now it’s a family favorite! Nancy, Thanks for the great tip. Just checked them out — very cool! Love that they have an organic option! I always learn so much from you Pamela. Thanks for sharing such great information. You’re welcome, Barbara. Thanks for stopping by. Thank you. I enjoy your recipes, tips and most of all the stories and epigrams. Keep ’em comin’.